The holidays are just around the corner and the 113th Congress is slowly coming to a close. It would be easy for us to settle for the status quo at the end of the session and beginning of the season–a short-term continuing resolution (CR) while cozied up next to a warm fire. 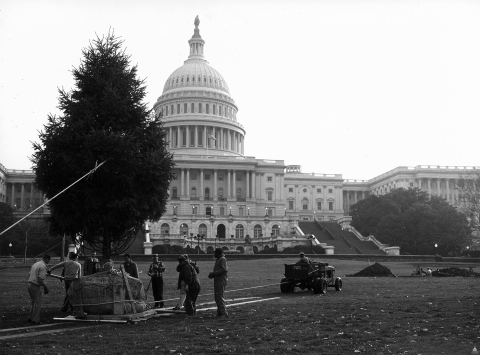 U.S. Capitol Christmas Tree in 1964. Source: Architect of the Capitol. But not so fast… the first two weeks of December will be critical for legislative action. House and Senate Appropriations Committee members and their staffers have worked diligently and collaboratively to make progress toward finalizing the fiscal year (FY) 2015 spending bills. It is unknown what the budget figure for NIH will be or if an omnibus bill is possible given tensions since Election Day, but current funding will expire on December 11, leaving Congressional leaders in a time crunch. If an omnibus bill is not drafted in the first two weeks of December, it is likely Congress will once again use a short-term CR and leave FY2015 decisions to the 114th Congress. We cannot settle for the status quo again, nor can we leave spending decisions to brand new legislators who have yet to know their constituents wishes and the needs of their cancer centers. Congress must pass a FY2015 spending bill before December 11. Please contact your Members of Congress in the coming days and weeks and urge them to collaborate with their colleagues in order to pass a FY2015 spending bill. The patients receiving treatments at our nation’s cancer centers depend on it.